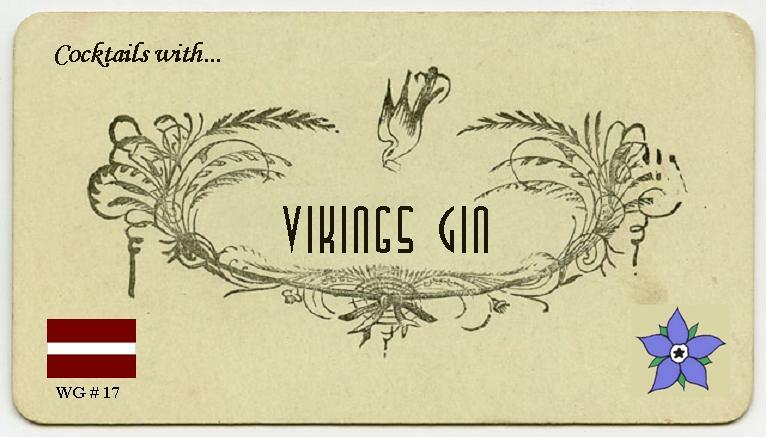 Dzins (Gin) Vikings is made by Latvijas Balzams from Latvia and, as of 2006, they were the biggest alcohol producer in the Baltic States; they have a 50% market share in all of the alcoholic drinks in Latvia. Latvijas Balzams has origins dating back to 1900 and make a wide range of spirits, liqueurs and other alcoholic beverages. In addition to Dzins Vikings, they make two other gins: LB Gin and the grain-based Gin Kristofors, which are both bottled at 40%ABV. Latvijas Balzams are also the bottlers for Stolichnaya’s international exports. The S.P.I. Company (who make Stolichnaya) own nearly 90% of the shares in Latvijas Balzams.I could only find minimal further information about the gin; the label speaks of a strong aroma and juniper berries, as well as it being balanced and highly mixable in cocktails. It is bottled at 47%ABV. The nose is quite strong on the alcohol and juniper, with some sweet vanilla. To taste, it is initially smooth, followed by a little tingle/heat, with notes of juniper and fruit. After a couple of seconds, the flavour evolves to be like pine, earthy and bark-like. There’s a medium finish of earthy juniper, which isn’t particularly clean on the palate. It reminds me of Juniper & Cedar Vodka. This drink was quite fresh, but also earthy and dry, with quite a lot of pine and juniper. I found it to be rather reminiscent of a Gin & Tonic made with some Czech, Russian (Veresk) and Swiss (Studer) gins. Not classic, but still nice. Warming and quite sweet, with big flavours that are not at all subtle. Some heat builds up after a while, but then the gin is bottled 47%, so this could be expected. Overall, this was a powerful and punchy Martini. Whilst I quite liked it, it certainly takes no prisoners. Quite soft initially, followed by a crescendo of herbal elements and an increasing bitterness. There’s a pleasant, bittersweet finish. This cocktail was very fresh and very, very crisp. I thought it was rather delicious, with a distinctively bitter herbal twist at the end. Rather refreshing and good for having with dinner. This was full of flavour, but it seemed a bit unbalanced and a bit rough. There’s a slight burn, so it is quite warming, but it doesn’t have the delicate clarity of flavour that I would expect from this gin drink. Not that great, really. Having said that, Mrs. B quite liked it, describing it as “spicy gin”; she proceeded to finish the glass. Again, the heat is still present in this cocktail, but the bitter herbal notes go well with the juniper-earthiness of the gin. I found it rather bracing and thought it could be smoother, but – still – it wasn’t bad. Dzins Vikings is, without a doubt, a strong alcohol product, full of flavour and, in particular, herbal notes. Whilst not the smoothest spirit in the world, it certainly has character. The Gimlet and Fruit Cup were my personal favourites from the cocktails that we tried, although the Martini was pretty interesting and rather robust. This entry was posted in World of Gin and tagged Dzins Vikins, Gin Review, Latvia Gin, LAtvian Gin, tasting, Viking Gin, World of Gin by DTS. Bookmark the permalink. As an aperitif to lunch, I’ve just done a quick side by side tasting. There is some similarity, earthiness yes. Both have some floral. Plymouth is smoother and has more Juniper. Vikings is an interesting product but quite strong, I’m sure you can handle it though!